Applying to UPEI is easy! Erica Buchanan started her postsecondary education at a university with more than 30,000 other students. But after four years of undergraduate training, she wanted something different for her nursing degree, and she found that at UPEI. UPEI's new Bachelor of Science in Paramedicine program offers a path for college paramedicine diploma graduates. Find out how Kensington, PEI's Mike Hannah is embracing the future of paramedicine at UPEI. 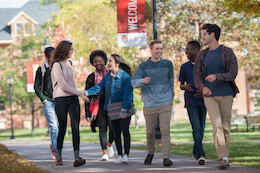 UPEI provides everything you need—engaged faculty and staff; unique programs; student supports; and a beautiful setting to make lifelong memories—all to ensure your education is what you want it to be. Apply today! Your potential is our promise. Your Potential is Our Promise!